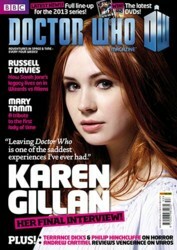 READ THE ULTIMATE INTERVIEW WITH AMY POND HERSELF, KAREN GILLAN � ONLY IN DOCTOR WHO MAGAZINE 453. Karen tells DWM about leaving Doctor Who after three years as the Doctor's companion: "I am so, so sad. I'm not going to lie. Leaving that show has to be one of the saddest experiences I've ever had. It was my life for, like, three years. That's going to take a while to go away. But also it's really exciting, because I get to go and do other things�"
DWM looks at the life and times of MARY TAMM, the actress who played the Fourth Doctor�s companion Romana, with never-before-seen photos and tributes from her friends and colleagues including LOUISE JAMESON, JOHN LEESON, and ANTHONY READ. Just how old is the Doctor nowadays? The clue�s in his hair, as showrunner STEVEN MOFFAT reveals, as he presents a missing scene from The Angels Take Manhattan � exclusively in PRODUCTION NOTES. DWM look back at the season that gave us the longest story ever, an evil future Doctor and Bonnie Langford, as THE TRIAL OF A TIME LORD is put under the spotlight in COUNTDOWN TO 50! Witness the greatest battle in history as the Daleks and Cybermen come face to face with the Tenth Doctor and Rose in Torchwood HQ. It�s DOOMSDAY � and what will THE TIME TEAM make of it all� ? It�s one of the most controversial issues currently challenging fandom � the Doctor�s morality. Are there circumstances where it�s acceptable for him to kill his enemies, or should this be avoided at all costs? TOBY HADOKE and JOHNNY CANDON argue the pros and cons in A BATTLE OF WITS. The Doctor, Amy and Rory encounter a legendary monster and terrifying creatures from another dimension in THE BROKEN MAN, the brand new comic strip written by SCOTT GRAY and illustrated by MARTIN GERAGHTY. Celebrate 20 years of BERNICE SUMMERFIELD, as DWM talks to PAUL CORNELL, LISA BOWERMAN, JAC RAYNER, GARY RUSSELL and SCOTT HANDCOCK about one of the most enduring Doctor Who characters of all time. The mysterious Watcher examines the Doctor�s little-known use of weaponry (including his ray-gun), challenges readers with The Six Faces of Delusionand champions another Supporting Artist of the Month, in WOTCHA! PLUS! All the latest official news, the latest episodes, DVDs, books and CDs reviewed, sneak previews of forthcoming merchandise, a prize-winning crossword, FIVE fantastic competitions and much, much more!